The Department of Community Development and Zoning promotes the comprehensive development and well-being of the Village of Franklin Park. The Department oversees economic development, planning and zoning and provides staff support for the Economic Development Commission, Plan Commission, Tree Preservation Commission and Zoning Board of Appeals. Staff uses a variety of resources to retain, expand and attract commercial and industrial businesses in the Village. The Department assumes a key role in providing the foundation for the successful implementation of development strategies to ensure the growth of a diverse and stable local economy. Please contact the Department directly with questions regarding zoning, development opportunities and tax incentives. 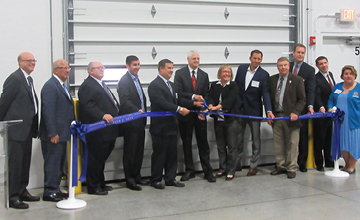 The Village of Franklin Park celebrated the completion of a new 178,516 square foot industrial speculative building by Ridge Development at the corner of Belmont, Elm, and River Road. Ridge Development had purchased the site at 9100 Belmont Avenue from multiple owners, including the Village. One of the parcels was formerly a brownfield, but was assessed under funding from the Cook County Brownfield Assessment project. The building is available for sale or lease. Watch the above video for an overview of the project, comments by Mayor Pedersen, and footage from the event. The Department of Community Development and Zoning has released a 2017 Year in Review, which looks back at the department's most notable achievements, projects and initiatives of 2017. New construction in 2017 totaled over 2.1 million square feet, and 57 million gallons of stormwater storage have been added to the Village in the last two years. Learn about these projects and more in the 2017 Year in Review. 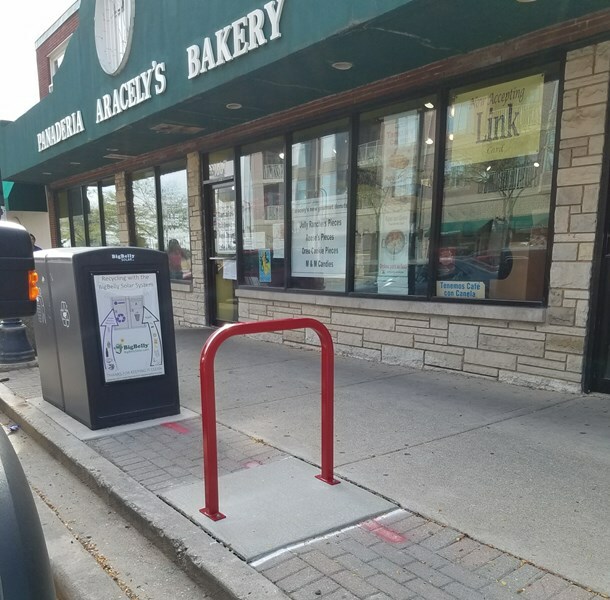 Active Transportation Alliance has provided three new bicycle racks for the Village of Franklin Park. Two of the racks were installed downtown on Franklin Avenue, and one was installed at East Leyden High School’s athletic complex on King Street. Previously, there was no bike parking at any of these locations. 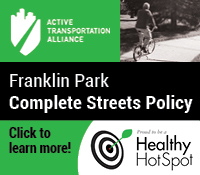 Active Transportation Alliance is a non-profit advocacy organization that works to improve conditions for bicycling, walking and transit. The bike racks were funded through grant dollars that Active Transportation Alliance uses to help communities with their policy implementation. The Department of Community Development and Zoning has released a 2016 Year in Review, which provides an overview of the department's most notable achievements, projects and initiatives of 2016. Over 1.2 million square feet of industrial building was constructed in the past year and an additional 620,000 square feet of industrial building is in the 2017 construction pipeline. Learn more about these projects and more in the 2016 Year in Review. The Village of Franklin Park celebrated the construction of a new 367,000 SF industrial speculative development by Molto Properties with a ribbon-cutting in early November of 2016. The new building at 10501 Seymour Avenue will be followed by construction of a second 106,000 SF industrial speculative building on the same site. Molto founder and senior principal Todd Naccarato discussed the project with Crain’s in 2015: “We're seeing substantial increases in rents, because these kinds of buildings are in demand right now. What we're seeing is, now that we're coming out of a recession a number of businesses are growing and want to expand. There's demand for newer buildings.” Colliers International is currently seeking industrial users for the new space, which is located across the street from O’Hare Airport and less than a mile to I-294 and the I-90 interchange. From left to right: Dan Abdo (Glazier Corporation), John Schneider (Director of Community Development and Zoning), Trustee Bill Ruhl, Mayor Barrett Pedersen, Trustee Cheryl McLean, Trustee John Johnson and Matt Baer (Chipotle). 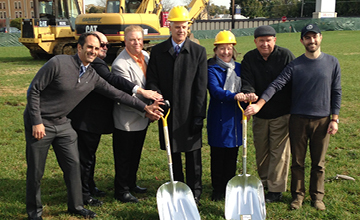 The Village of Franklin Park held a groundbreaking to celebrate the start of construction of Glazier Corporation’s retail development on the corner of Mannheim Road and Crown Road, just north of Grand Avenue, which is now underway. Glazier closed on the 42,000 SF vacant site in October to develop a 3-unit retail center fronting Mannheim Road. Chipotle and T-Mobile have already signed leases for the space. Glazier plans on working through the winter, weather permitting, and expects the development to be operational by summer of 2017. The Village of Franklin Park partnered with Leyden High School District 212, Triton College and local manufacturers in October of 2016 to celebrate Manufacturing Day, a national event that addresses common misperceptions about manufacturing by giving manufacturers an opportunity to open their doors to the public. 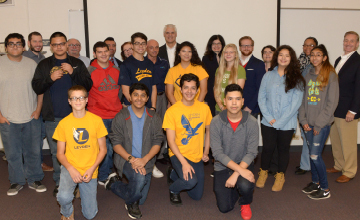 Students from Leyden High School District 212 toured Triton’s educational facilities and the manufacturing facilities of Life Fitness, Sureway Tool, and Sloan Valve. Participating students toured the manufacturing floor and offices of each facility and were able to ask questions about day-to-day operations, technical training requirements and advancement opportunities. The event aims to attract future manufacturing workers to fill the industry’s shortage of skilled labor, improve the public image of manufacturing and ensure the ongoing prosperity of the manufacturing industry. The Manufacturing Day event builds on a larger Village initiative to address workforce challenges in the industry by connecting manufacturers, training agencies and prospective workers. 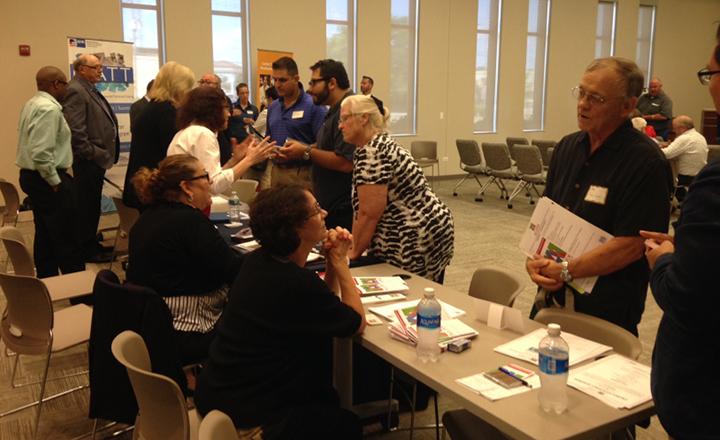 Local business owners and operators learn about available workforce programs and services from regional agencies at the 2016 Franklin Park Workforce Training Forum. Mayor Barrett F. Pedersen and the Village of Franklin Park held a Franklin Park Workforce Training Forum on July 14, 2016. This free event put business owners and operators in direct contact with workforce training agencies to help them address various challenges in workforce development and training. Participating workforce agencies included: The Chicago Cook Workforce Partnership, the Illinois Manufacturing Excellence Center (IMEC), the Alliance for Industry and Manufacturing (AIM), the Illinois Consortium for Advanced Technical Training (ICATT), the Chicago Federation of Labor (CFL), Triton College and the Franklin Park / Schiller Park / River Grove Chamber by O'Hare. You can read more about this successful event in a Chicago Tribune article. Visit the Franklin Park Workforce Training webpage for information on the workforce agencies the Village partners with. 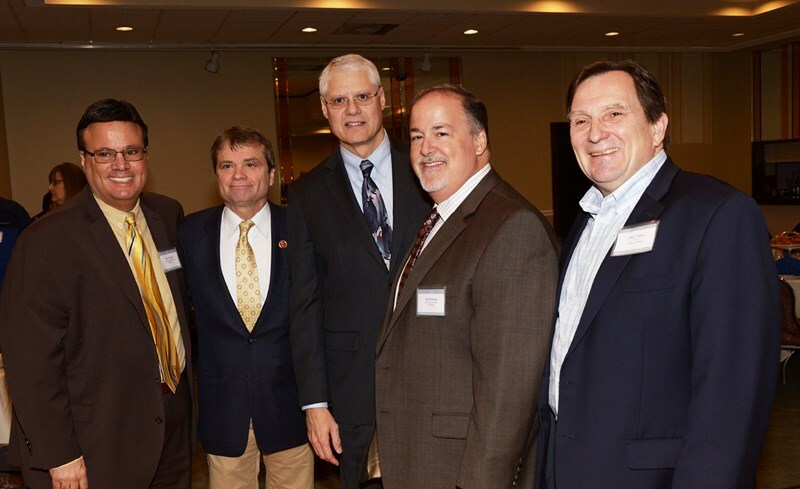 Commissioner Peter Silvestri, Congressman Mike Quigley, Mayor Barrett Pedersen, Commissioner Sean Morrison and Northlake's Mayor Jeffrey Sherwin at the 2016 Annual Business Appreciation Luncheon. The Village of Franklin Park hosted its 2016 Annual Franklin Park Business Appreciation Luncheon on Friday, April 22 at Pescatore Palace. Representatives from businesses, organizations and government agencies were in attendance. The event's guest speaker, Congressman Mike Quigley, spoke on various economic development initiatives occurring at the Federal level and their significance for Franklin Park's business community. Speaking on behalf of one of Franklin Park’s newer companies, Angelo Lollino of Alamode Foods spoke on the benefits of locating his business in Franklin Park as the supplier of gelato and coffee products to all Mariano's store cafes. Elected officials and representatives from the State of Illinois, Cook County, Chicago Cook Workforce Partnership, Chicago Metropolitan Agency for Planning and various workforce training agencies were present to provide information and take questions and comments from local businesses. The Department of Community Development and Zoning has released a 2015 Year in Review outlining the Village's most notable achievements and initiatives of the past year. In addition to receiving designation of the Franklin Park Enterprise Zone, the Village was awarded $2.3 million in grants and $9.3 million in low-interest loans to fund infrastructure and economic development projects in 2015. Industrial and retail vacancy continued to drop as businesses take advantage of the Village's excellent locational assets and development opportunities. 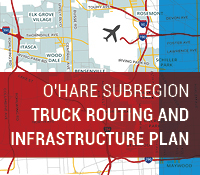 Staff is preparing for approximately 1.2 million square feet of industrial speculative building in the construction pipeline for 2016 and continues its work on various planning projects, including the Franklin Park Comprehensive Plan, the O'Hare Subregion Truck Routing and Infrastructure Plan and the Franklin Park O'Hare Industrial Corridor Plan. Learn about these projects and more in the 2015 Year in Review. The Illinois Department of Commerce and Economic Opportunity (DCEO) certified that the Franklin Park Enterprise Zone will be in effect for 15 years starting January 1st of 2016. The Village applied for designation of an enterprise zone for its commercial and industrial properties, which account for 50% of the Village’s land use. The designation makes several significant incentives available to qualified properties in the Village. Most notable of these is a State sales tax exemption of 6.25% on building materials to be used in the enterprise zone. 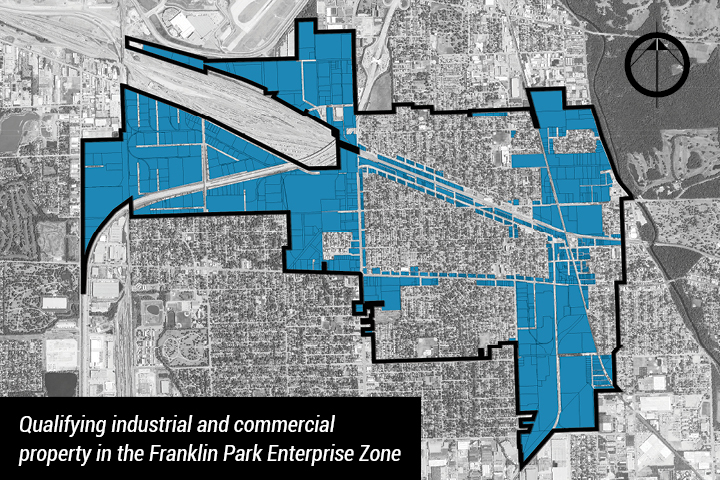 The Franklin Park Enterprise Zone will encourage commercial and industrial development and redevelopment in the Village. Qualifying commercial and industrial properties are displayed in the Illinois Department of Revenue's Franklin Park Enterprise Zone Map. Contact the Department of Community Development and Zoning at (847) 671-8276 to learn more and to obtain an application for project designation. 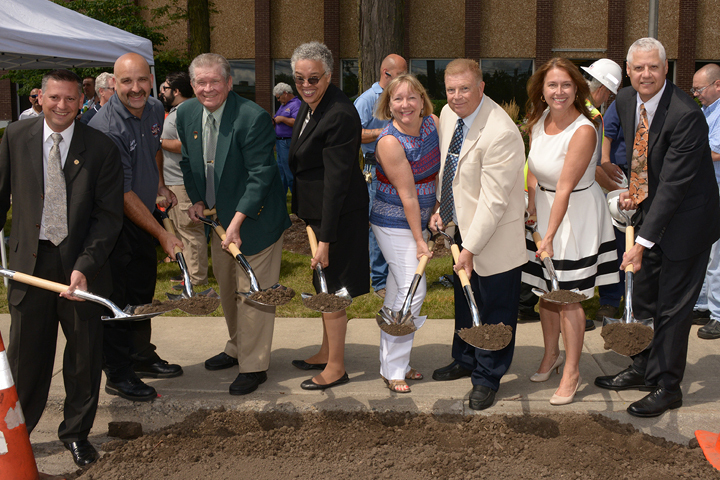 Cook County President Toni Preckwinkle and representatives of various government agencies joined Mayor Pedersen and Village Trustees on Wednesday, August 12, 2015 for a ground breaking ceremony to commemorate the Cullerton Street Industrial Area Project, which is already underway. The Cook County Bureau of Economic Development awarded the project a $3 million low-interest loan through the first BUILT in Cook HUD Section 108 Loan Program to assist with financing. The project also received a $1.3 million grant from the Illinois Department of Transportation to assist with project financing. Businesses and property owners in the project area have also committed to financing a large portion of the project through a Special Service Area (SSA). 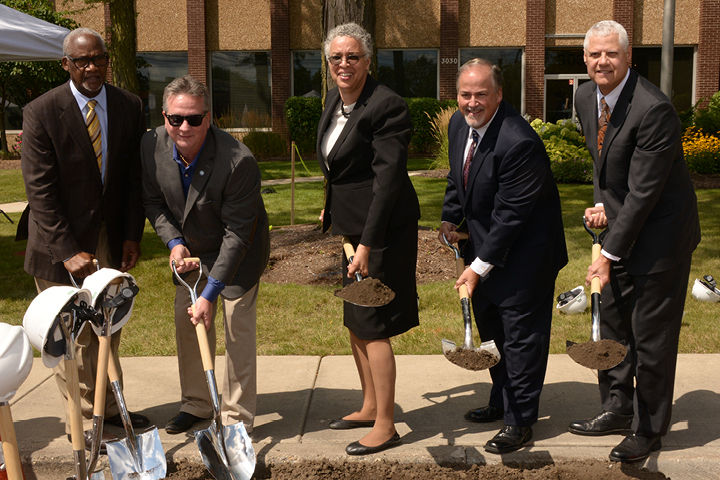 President Toni Preckwinkle and Mayor Barrett Pedersen spoke on the importance of business and government collaboration to retaining and creating jobs in the Village. You can read the full Cook County Press Release on the Cook County blog. The Department of Community Development and Zoning strongly recommends scheduling an appointment with staff to discuss applications for zoning relief or economic development programs before submitting final applications to the Village.